On the 19th of November 2018, violinist ALEXANDRU TOMESCU once again won the right to play the Stradivarius Elder-Voicu violin - an Object of National Heritage - by 2023, in a contest organised by the Ministry of Culture and National Identity and the George Enescu Philharmonic. At the beginning of the year, Tomescu will take the stage at Sala Radio in a concert that is 100% HAYDN! The concert performed on Wednesday, 16th of January (19:00) by the Radio Chamber Orchestra will take place under the wand of a special guest: LADISLAU HORVATH. 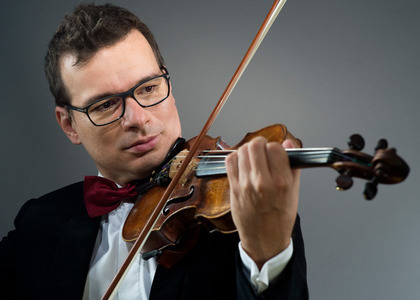 A musician with a successful international career, Ladislau is the concertmaster of the prestigious Italian orchestra Maggio Musicale Fiorentino, where he has collaborated with the great conductor Zubin Mehta for more than 25 years. Often considered as "the parent of the symphony", Mozart and Beethoven's friend and mentor, Joseph Haydn is one of the most prolific composers of all time: he created 104 symphonies, almost 90 pieces for string quartets, 62 piano sonatas, multiple concertos, oratories and so on. 2019 will mark the 210th anniversary of his death. At the concert in Sala Radio, you will listen to three of his creations: the overture from the opera L'Isola disabitata, the Concerto for Violin and Orchestra No. 1 and Symphony No. 101 - the Timepiece. The concerts will broadcast live on all the frequencies of Radio România Cultural and Radio România Musical in Romania, and sstreamed live on www.radioromaniacultural.ro and www.romania-muzical.ro.